A remarkable album from Martin Simpson and his then wife, Jessica, with the band Flash Company. 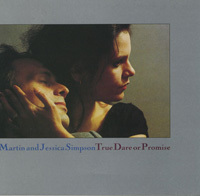 True, Dare or Promise features some of Martin Simpson’s most imaginative guitar playing through a remarkable series of arrangements that stretch British folk-rock towards the avant garde! The ensemble also features the fine (and much lamented) songwriter John B Spencer. Although they only performed a handful of gigs this album captures all the early promise of a fine ensemble.